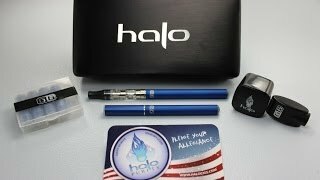 Halo is known as one of the best e-liquid companies on the planet, and they also carry one of the most popular electronic cigarette starter kits online too. They have mastered the art of making delicious liquids, and it only makes sense that they should have a speciality made e-cigarette to use with their juice. In fact, Halo carries two completely different starter kits, the small yet powerful Halo G6, and the larger Halo Triton. The G6 is an amazingly satisfying and stunningly beautiful device that has impressed many who use it. Halo makes buying an electronic cigarette kit fun by giving you the choice of 9 vivid colors of batteries that are available in 2 different sizes. The shorter 65mm battery or, the longer 75mm battery for no extra charge! From the standard white to the bright pinks and greens, they should have a color you like. Being one of the best-looking cig-a-likes on the market is nice but that's not going keep you from smoking cigarettes. The most important aspect that an e-cig has to have (especially for beginners) is that heavy lung-filling-throat-hitting ability to keep you from picking up a pack of smokes. The G6 is one of the few devices that deliver consistently. This kit was probably my fourth or fifth e-cig starter kit before finding a winner. Once I started using my G6, I stopped trying out others because I found that one that kept my mind off tobacco. Love this kit and I stand behind it 100%. Each starter kit comes with a 5 pack of cartridges pre-filled with your choice of their yummy e-liquid, a wall charger, a USB adapter, and a spiffy carrying case to pack it all in. For the price, Halo gives you more for your money than most any other electronic cigarette company out there. You can even fill your own cartridges if you buy some of their Blank Cartridges. I would suggest using these if you would like to save some money and change your flavors, as it will cost less in the long run if you buy your e-liquid in the bottles instead of prefilled cartridges. Simply buy the blanks and then get a bottle of e-liquid to fill them with. Each cartridge can be refilled 5-10 times, or until the liquid starts to taste bad. If you prefer a larger capacity cartridge, grab a Mini Tank. The Mini Tank holds more juice and does not have poly-fill to suspend the liquid in, so you get the most natural taste from the vapor. The Mini Tank is great for a heavier user or if you simply don't want to fill your cartridges often. The G6 electronic cigarette from halo includes features you won't find in any other device. With features such as the FLAMEGUARD that help to prevent your heating element from burning your liquid, and the THERMAFLOW feature that constantly provides a smooth supply of vapor. 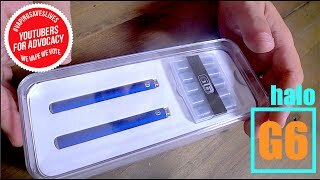 All of these little details make Halo’s G6 one of the best electronic cigarette starter kits that you can buy. Halo carries the best e-liquid hands down, but add some of that liquid to the G6 electronic cigarette and you will be both impressed and satisfied with the results. You will not need to puff on it 3-4 times to get enough vapor to fill your lungs, it will give you a big cloud of vapor in just one drag! The only problem with the G6 is that it so enjoyable that you will run the battery down in less than a day. Just make sure one battery is always charging and you won't run out. If you consider yourself a heavy smoker, I would recommend picking up an extra battery for the car or office. The Halo G6 is under $50 making it not only a great device but also has a great price point.